Between 1946 and 1957, Leon Hart’s gridiron accomplishments are awesome: won the 1949 Heisman Trophy; named All-American three years at Notre Dame; played on Irish teams that in four years never lost a game and won three national championships; helped the Detroit Lions to three NFL titles; and won All-Pro honors in 1951 for defense and offense. One of Hart’s memorable TD catches came in 1948 against Southern California. The prototype of the modern tight end, he took a short pass from (NPASHF 1997 inductee) Frank Tripucka and broke eight tackles enroute 40 yards to the end zone. Few football players will ever achieve the individual and team honors Leon Hart gained during an illustrious 12-year collegiate and professional career. Hart, the product of a Polish mother and Ukrainian father, was a coach’s dream. At 6-feet-4-inch, 240 pounds, he had both speed and agility and played both ways for Coach Frank Leahy’s Irish teams that posted a near-perfect 36-0-2 won-lost-tied record. Hart was the prototype of the modern tight end with his blocking and pass catching ability. On defense, he was a sure tackler and relentless rusher. During his four-year career at Notre Dame, Hart scored 13 touchdowns and caught 49 passes for 751 yards. His biggest score came in a 1948 game at Southern California when he caught a short pass from fellow NPASHF inductee Frank Tripucka and broke eight tackles for a 40-yard touchdown. However, the game ended in a 14-14 tie and cost the Irish the National Championship to Michigan. Notre Dame bounced back in 1949 winning all 10 of its games and capturing its third national title in four years. In the last game of the season, a 27-20 victory over Southern Methodist University, the big end was also called upon to play fullback as the Irish rallied to down a stubborn Mustang team led by Kyle Rote. When the Heisman votes were tabulated in 1949, Hart was an easy winner. He got 995 votes to 272 for runner-up Charlie “Choo Choo” Justice of North Carolina. Hart was also named “Athlete of the Year” by the Associated Press, beating out such big names as baseball’s Jackie Robinson and golfer Sam Snead. A first-round draft choice of the Lions, Hart played his entire eight-year career (1950-57) in Detroit. In 1951, he became the last player to be voted All-Pro on both offense and defense. That season he led Coach Buddy Parker’s team in receiving with 35 catches for 544 yards and 12 touchdowns. Detroit, led by Hart, quarterback Bobby Layne and running back Doak Walker, became the dominant team in the NFL. The Lions beat the Cleveland Browns three times for the World Championship: 17-7 in 1952; 17-16 in 1953; and 59-14 in 1957. Detroit also played in the 1954 championship game, losing to Cleveland. During his career with the Lions, Hart scored 31 touchdowns to rank eighth on the all-time Detroit TD list. Only six Lions have scored more than Hart’s 25 touchdowns on passes. When his football playing days ended, Hart used his mechanical engineering degree from Notre Dame and entered the business world. He served as Regional Manager for Sun Electric Company in Farmington Hills, Michigan for many years. One of his sons, Kevin, lettered three years (1977-79) as a tight end for the Fighting Irish. In 1973, Hart was elected to the National Football Foundation Collegiate Hall of Fame. 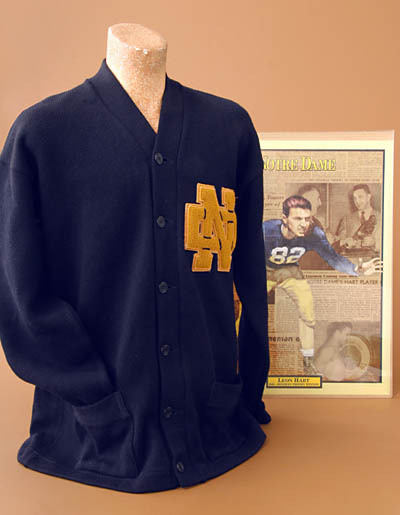 An avid Irish fan, Hart often attended Notre Dame home games. In September, 2003, he watched Notre Dame defeat Michigan at South Bend. A few days later, on September 24th, he died. The bodies of both he and his wife are interred at the campus cemetery at Notre Dame. For three of four years between 1947 and 1950, a Polish American won the Heisman Trophy. Notre Dame’s Johnny Lujack won the trophy in 1947, teammate Leon Hart in 1949, and Ohio State’s Vic Janowicz in 1950. All three are inductees of the National Polish-American Sports Hall of Fame. The 1948 Heisman Trophy winner was Southern Methodist’s Doak Walker. If he had some Polish blood in him, that would have been four straight! Three Polish American Hall of Famers were members of coach Frank Leahy’s National Champion Notre Dame Fighting Irish in 1946 and 1947. They were Hart, Lujack and Lineman Ziggy Czarobski. Czarobski was inducted in 1980.